Photo Contest Awards, Macs and More! NOTE: This event is at a new location! Photography and Macintosh computers, what a powerful combination! Over the years, the same was said of desktop publishing or of music or of video or of just about anything having to do with media and the Mac. It all started 25 years ago with the original Macintosh. Our second presentation will be a retrospective of Macs over the years. We'll move forward in time from 1984 to the present and we'll be marking major milestones along the way. As a special bonus we'll have several older Macs on display, and you can relive your life and tell others of your wonderful discoveries, trials and triumphs. As if an awards ceremony and Mac retrospective weren't enough all by themselves ... there's more! After lunch, rather than our regular Special Interest Group meetings we'll be having a guest speaker from Apple. Both the iPhone OS and Mac OS X are due for upgrades. Come learn what to expect from iPhone OS 3.0 and Snow Leopard. Be ahead of the curve; know what to anticipate. Both these upgrades promise a bright future. Our May 30 meeting will be held in Enterprise Hall at George Mason University. Coffee will be served before the meeting and during the break. Please, note and heed the fact that food and drinks are not allowed in the meeting rooms. As always, check back here for any updates on this meeting. The meeting is being held in Enterprise Hall, Room 178; No. 13 on GMU campus map. The closest parking is in the Sandy Creek Parking Garage, a pay-for-parking facility. 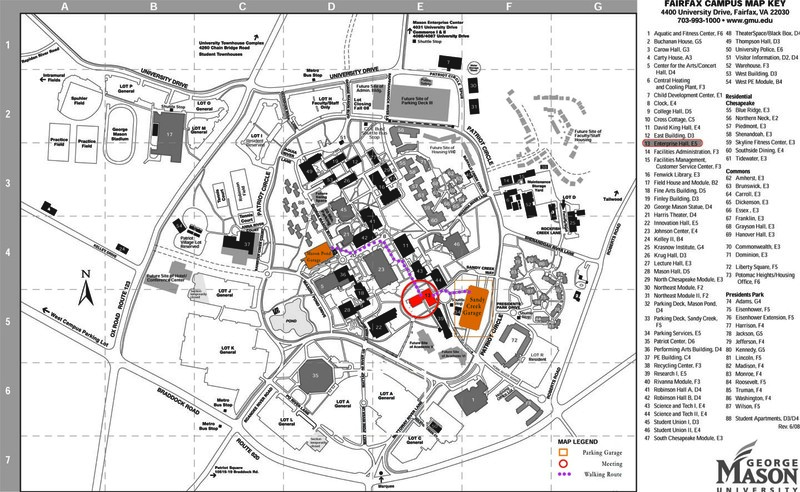 Park in the lowest level and, with parking pass in hand, take the elevator to the third floor (Campus Level). You will now be at the correct level for the short walk to Enterprise Hall. Also, there are three handicap parking spaces next to Enterprise Hall that can be used by members, on a first come first served basis. They should have their Handicap Stickers showing on the dashboard or on the rear-view mirror. Everyone should bring their parking pass to the meeting. The Pi has procured a large number of validation tickets, which can be used to pay for parking — they offer a considerable savings over the $8 daily rate. These tickets will be available to attendees for a $3 donation fee to help defray a portion of the cost. Please, bring some single dollar bills to facilitate the exchange. Passengers can be dropped off in the traffic circle at the front of the building. We are contemplating using a member’s van to shuttle folks from third floor parking garage exit to the front entrance of the building; however, the walking distance is really not far. Any additional messages will be included in an Announce list email message.